Can your insurance company do this? Automated threat and intelligence alerts. Automated threat and intelligence alerts. 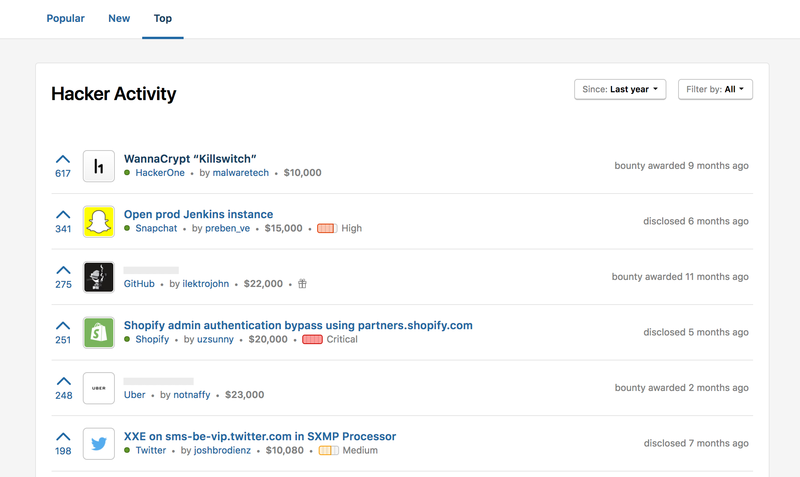 Security benchmarking. DDoS mitigation. Ransomware protection. All included, at no additional cost. 81% of hacking-related breaches leverage either stolen or weak passwords. Coalition’s Credential Monitor alerts your organization when an employee’s password or identifying information is stolen and may be used by a hacker. Once a source of intelligence generally only available to large corporations with dedicated security teams, Coalition makes this valuable threat intelligence available to all of our policyholders. 71% of companies targeted by ransomware attacks are infected, and the results aren't pretty. A company is hit with ransomware every 40 seconds according to the latest data from Kaspersky. 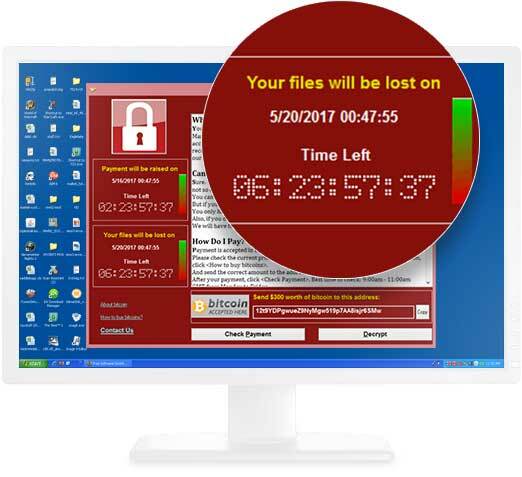 Coalition’s provided anti-ransomware software (currently available for PC) protects your business against 99% of known ransomware, including WannaCry and Petya/NoPetya. 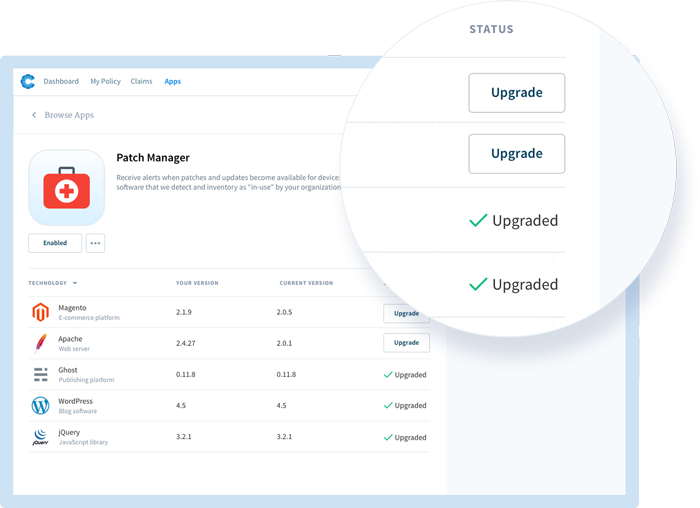 Now, with minimal effort, you can protect your organization from the disruptive attacks that have impacted the likes of Nissan, Fedex, the Hollywood Presbyterian Medical Center, the San Francisco MUNI, and numerous other small and medium businesses. Over 40% of breaches result from the exploitation of unpatched software and vulnerable Internet-connected devices. 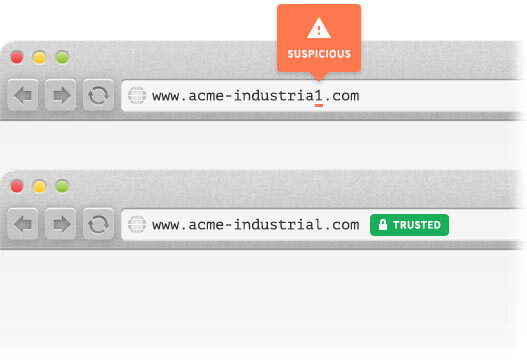 Never miss an update or reported vulnerability again. Coalition’s Patch Manager passively scans your internet-facing infrastructure for out-of-date software and vulnerabilities. 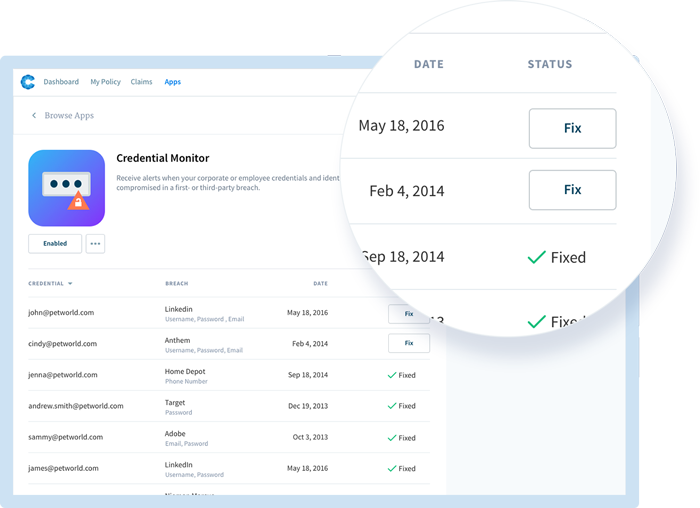 Configure alerts and work with our security team (at no additional cost) to protect your business. 75% of breaches are perpetrated by outsiders. Companies today are under the constant threat of breach. Whether through phishing, denial of service, or malware threats, Coalition’s Threat Monitor combines threat intelligence and analysis to mitigate the likelihood of a breach before the damage is done. This includes passive monitoring for signs of phishing activity, anomalous network and DNS activity, domain monitoring, and other indicators of breach, as well as practical advice for how you can protect your business. Loss of revenue following a denial of service attack during peak business hours can cost a small or medium business upwards of $200K/hour. 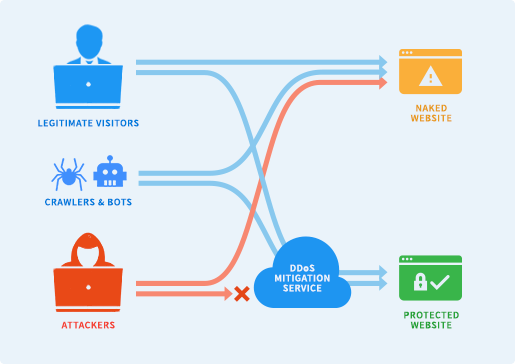 Coalition’s provided denial of service (DDoS) mitigation service is always-on, and can easily be setup in under 4 minutes. This service includes over 15 Tbps (terabits p/second) of available network capacity, over 300x the capacity of the average large DDoS attack. Enlist ethical hackers to protect your business. 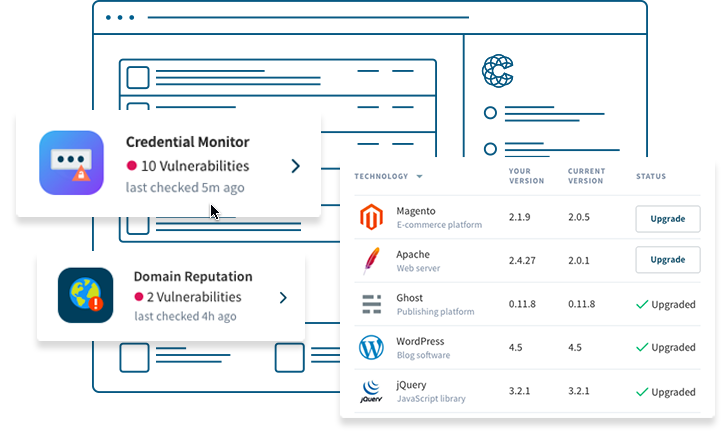 Create a vulnerability disclosure program on HackerOne to receive and respond to vulnerabilities discovered by ethical hackers – before criminals can exploit them. 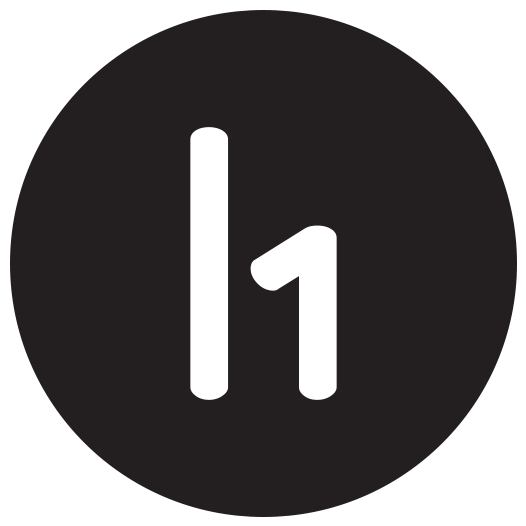 Coalition automatically rewards policyholders with a program publicly listed in the HackerOne directory. For more information, or to learn how you can insure with Coalition, contact us. Do I need to have Coalition insurance in order to use the apps? Yes. However, we hope to soon make available certain apps to the general public at no cost irrespective of whether insurance is purchased or not. Is usage of Coalition’s apps required to maintain insurance? No, usage of the apps provided by Coalition is strictly for our policyholders’ benefit, and not required to receive or maintain insurance coverage. However, usage of certain apps may qualify a policyholder for premium discounts or enhanced coverage. Disabling an app may reverse a discount or eliminate a coverage enhancement. Beyond our apps, policyholders may also access their policy documents and coverage information within their online dashboard. The apps platform is merely another great way to visualize risk posture, and to receive notifications and alerts to prevent and mitigate cyber incidents. Can I configure an app to alert others in my company? Yes, of course. We understand that it takes a village to protect a village. Each app can be configured to send alerts to anyone you choose whether that is a colleague, outsourced IT firm, or otherwise. You can also set up account access for additional users in your organization. Built to address high stakes, complicated, rapidly evolving risks. We believe that cyber risks should be underwritten and managed by those with a core competency in security assessments, technology, and attack response. Coalition is the only insurance provider with a fully integrated approach to cyber risk management.